Just about everyone loves Mexican food, but should you eat it if you want to manage your weight or diabetes? Yes, absolutely! There are literally hundreds of authentic Mexican dishes that are naturally healthy - moderate in calories, fat, and sugar - and completely delectable. In Naturally Healthy Mexican Cooking, Jim Peyton presents some two hundred recipes that have exceptional nutrition profiles, are easy to prepare, and, most important of all, taste delicious. Peyton starts from the premise that for any diet to work, you have to enjoy the food you're eating. Substitutions that alter the taste and pleasure of food, such as nonfat yogurt for mayonnaise, have no place here. Instead, you'll find tasty, highly nutritious, low-calorie dishes from the various schools of Mexican and Mexican American cooking in Texas, New Mexico, Arizona, and California. From traditional meat, seafood, and vegetarian entrees and antojitos mexicanos, including tacos, enchiladas, and tamales, to upscale alta cocina mexicana such as shrimp ceviche and mango salsa, these recipes are authentic, simple for home cooks to prepare with supermarket ingredients, flavorful, and fully satisfying in moderate portions. Every recipe includes nutritional analysis - calories, protein, carbs, fat, cholesterol, fiber, sugar, and sodium. In addition to the recipes, Peyton offers helpful information on diet and healthy eating, Mexican cooking and nutrition, ingredients, cooking techniques, and cooking equipment. Try the recipes in Naturally Healthy Mexican Cooking, and you'll discover that comfort food can be both delicious and good for you. !Buen provecho! Just about everyone loves Mexican food, but should you eat it if you want to manage your weight or diabetes? Yes, absolutely! There are literally hundreds of authentic Mexican dishes that are naturally healthy - moderate in calories, fat, and sugar - and completely delectable. 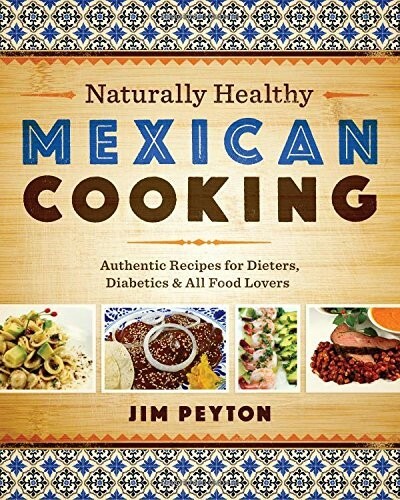 In Naturally Healthy Mexican Cooking, Jim Peyton presents some two hundred recipes that have exceptional nutrition profiles, are easy to prepare, and, most important of all, taste delicious.Peyton starts from the premise that for any diet to work, you have to enjoy the food you're eating. Substitutions that alter the taste and pleasure of food, such as nonfat yogurt for mayonnaise, have no place here. Instead, you'll find tasty, highly nutritious, low-calorie dishes from the various schools of Mexican and Mexican American cooking in Texas, New Mexico, Arizona, and California. From traditional meat, seafood, and vegetarian entrees and antojitos mexicanos, including tacos, enchiladas, and tamales, to upscale alta cocina mexicana such as shrimp ceviche and mango salsa, these recipes are authentic, simple for home cooks to prepare with supermarket ingredients, flavorful, and fully satisfying in moderate portions. Every recipe includes nutritional analysis - calories, protein, carbs, fat, cholesterol, fiber, sugar, and sodium. In addition to the recipes, Peyton offers helpful information on diet and healthy eating, Mexican cooking and nutrition, ingredients, cooking techniques, and cooking equipment.Try the recipes in Naturally Healthy Mexican Cooking, and you'll discover that comfort food can be both delicious and good for you. !Buen provecho!